SIG P210 barrels are designed to shoot standard Swiss Army pistol ammunition, the Pistolen Patrone 41, made by RUAG in Thun. This 124gr. NATO-spec FMJ 9x19mm round originally came in 24-round boxes, which sufficed to load three magazines. Like the RUAG rifle ammunition, it has replaced its original nickel alloy bullet jacket with a jacket made of copper. Its headstamps are the same as for the RUAG GP90 rifle round, comprising a T for the factory location in Thun, placed above the last two digits of the year of manufacture. The Pistolen Patrone 41 was originally produced for the P49, loaded with WIMMIS, a slow burning pistol powder. According to the KTA Reglement 53.103 d, it develops 2600 bar chamber pressure. (The published maximum chamber pressure for 9mm Para per CIP is 2350 bar.) 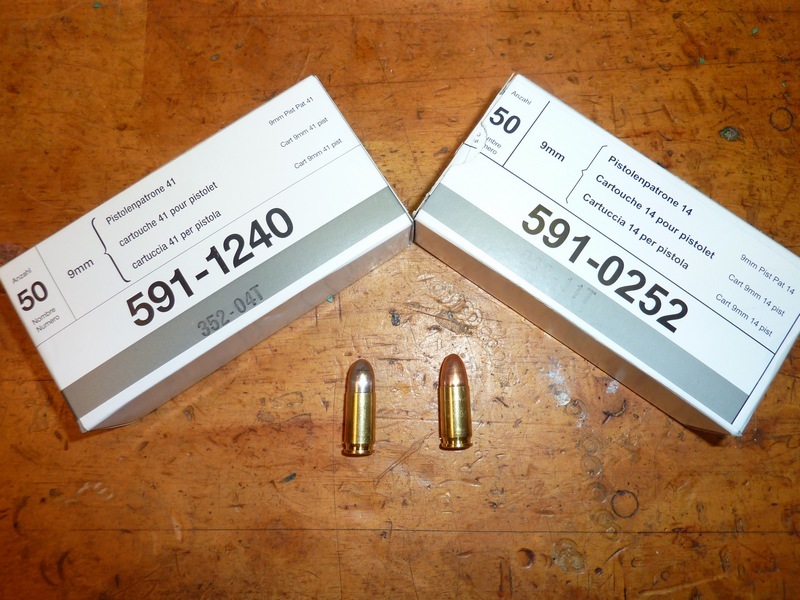 Available for purchase at pistol ranges throughout Switzerland, and distributed to Swiss citizens during Schützenfesten, unlike other RUAG ammunition, it is restricted from export, but may be found in small quantities on the collector market. It is a high-pressure combat round, accurate albeit not optimized for target shooting. The PP41 was originally meant to be used with the then newly introduced, toggle-operated W+F MP Model 41 (Furrer Model 1941) and the Solothurn MP 41 (Suomi Model 1931) submachine guns, at the time when the standard issue KTA pistol round was 7.65mm Para. The idea to adopt the Pist Pat 41 as the new standard issue came up at the pistol trials held in 1942, in connection with the ill-fated W+F 9mm Pistol 29 prototype. The Furrer 41/44 SMG was gradually decommissioned after WWII, but the Suomi lingered until at least the late Eighties. It's likely that the pressure of the Pist Pat 41 was kept well above the CIP and NATO standard for SMG compatibility, which probably also accounts for KTA proving 9mm Para arms at 50% overpressure instead of following the CIP practice of 30% overpressure proof loads. Earlier in this year, RUAG introduced the PP14 under the brand Geco Sintox as the cartridge meant to succeed the PP41. It is currently manufactured in Switzerland and copied under license by MSF in Hungary. Accordingly, the current 50-round boxes are labeled EU or Switzerland. nope. swiss citizens pay for participation in cantonal or federal Schützenfesten; ammo is included in the price. during a Feldschiessen / Tir en campagne, however, 20 shots of ammo for the programme *are* given for free to all participants.